In less than a month, I will graduate from my MBA program at Georgetown University with more than $120,000 in student loans at 7% interest. Six months after graduation, my grace period will end, and I will have to start repaying more than $1,000 per month. Here is my strategy for repayment. The first thing I have to figure out is how to increase my income from its current level. Without more money coming in, there is no chance for me to pay down my debt and maintain my current lifestyle. Some student loan repayment strategies I’m considering are taking on another job while I continue making money on my hobbies like blogging, graphic design and website development on nights and weekends. Right now, I have thirteen student loans outstanding. Once the payments start after my grace period is up, I will have a paperwork nightmare. To simplify the repayment process and fix my interest rate, I am going to consolidate my federal student loans into one loan. Since I do not have any private student loans, I will be able to consolidate through the Direct Loan Consolidation program and avoid paying loan consolidation fees. There are several student loan repayment plans available to borrowers. Recently, a new plan was created called the Income-Based Repayment Plan. When I started my business in school, I chose to take a lower salary so I could reinvest more in my company’s growth. As a result, my Adjusted Gross Income was relatively low last year and the income-based repayment plan may be the best option for me. It may not be the same for other borrowers, so make sure to consider your repayment options and find the best repayment plan for your situation. One of the keys to successful student loan repayment is creating a budget and sticking to it every month. Personally, I use this budget and cash flow worksheet to track where my money goes and set spending goals each month. No matter your method, find a way to hold yourself accountable so you never miss a payment on your student loans. There are a couple strategies I plan to employ to reduce the amount of interest I pay on my student loans. First, I am going to make a payment every two weeks, rather than one payment each month. This method is called rapid repayment. By paying every two weeks rather than once a month, I will reduce the amount of interest I pay dramatically over the life of my loan. Additionally, rapid repayment forces me to apply one additional payment to my loan each year. If I pay once a month, I make twelve payments per year. If I pay every two weeks, I make 26 bi-weekly payments, or the equivalent of thirteen months of payments each year. 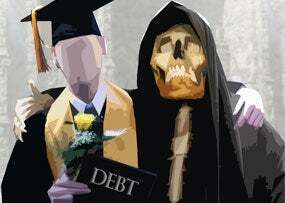 Debt repayment requires discipline and sacrifice. While I want to take bonuses and gifts and buy fun stuff, I simply cannot. The top priority after graduation is to eliminate my student loan debt as quickly as possible. In the past, my priority was building up my emergency savings fund. My new goal is to repay my debt. The choice is simple. Repaying my student loans is the equivalent to putting my money into something that returns a fixed rate of 7% each year. With interest rates on savings accounts and CDs paying low interest rates, it makes more sense to apply excess cash toward debt repayment. So whenever I get extra cash in my bank account, I will use it to pay off my loans first. Eric Bell is the Founder and Editor-in-Chief of YoBucko.com—a personal finance website that helps 20-somethings learn to save money, pay off debt and invest for the future. You’ve compiled a great list here. The only thing I would add is to live frugally for as long as you can and that will help save a little to go towards debt each month. Good luck! Sounds like you have an excellent plan for debt repayment and on to bigger and better things. Best of luck to you! This is seriously great advice. One thing that I particularly love is that you are talking about how you’ll be working hard and taking advantage of opportunities to PAY DOWN your debt. Many people out there are asking for loan forgiveness right now, so it’s great to hear how your working hard to pay it off. That’s exactly what I advocate for on my site. We help grads find creative ways to earn more side money to put toward paying down their debts fast. Great ideas, but I’d love to hear back from you in a year after you put these strategies to use in the real world. If you don’t even have a job lined up, I find the rapid repayment strategy particularly laughable. I took a night job and planned to put all of the money from it toward my student loans. Then I was laid off from my day job and had to live off the night job money for months at a time. Great plan I had until life got in the way. Wow basic common sense. I was really hoping for something of a revelation here other than “make more money, consolidate loans”. Thanks for sharing what everyone already knows. the best way to repay your student loan is to have a side job aside from your regular job., Conveniently through online and avoid unnecessary spending. Hola! I’ve been reading your weblog for a long time now and finally got the bravery to go ahead and give you a shout out from Austin Texas! Just wanted to say keep up the great job! I always tell consumers to start at FastWeb which is considered a legitimate scholarship search site. Also if you know what school you are applying to, you may want to talk to their financial aid office as they may have information on local scholarships as well. However, keep in mind that scholarships typically make up a very small percentage of college funding overall. Very few students pay for a significant portion of their education through scholarships.Good luck with your schooling!